My kids are always admiring the big fancy cakes and cookies I make for other kiddos. When it comes to their birthdays however, it seems mom is always running short on time. Their cakes are never quite as fancy and I rarely have extra time to make cookies for them. Also, we usually have tiny little parties with less than 10 guest, so there really isn't a need for a gigantic cake. This is just the way it is. 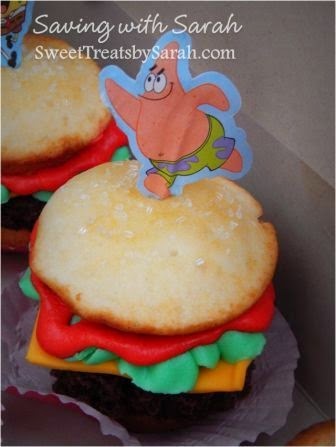 So I'm showing you the quick cakes, cookies and cupcakes I made for my daughter's birthday party parties this year. My Ellen chose RAINBOWS as her theme. Ok. Rainbows. First up: Easy cookies for school party. Yes - easy. 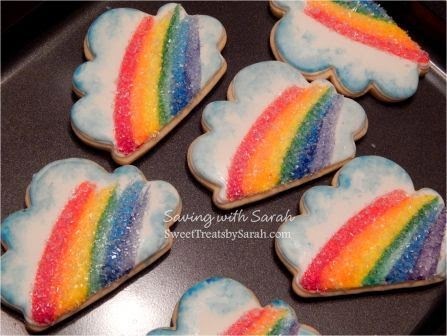 Flood them with white icing, paint on rainbow and cover in sprinkles - DONE! Next: Family party cake. 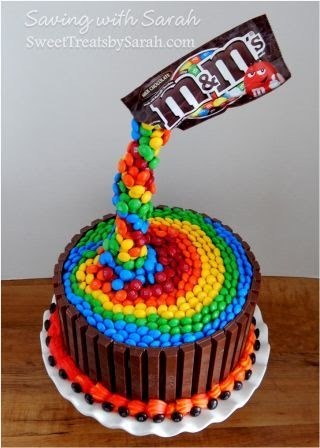 I figured this M&M's and Kit Kat cake would be quick. I hadn't planned on spending so much time placing the M&M's, but overall it was pretty fast. 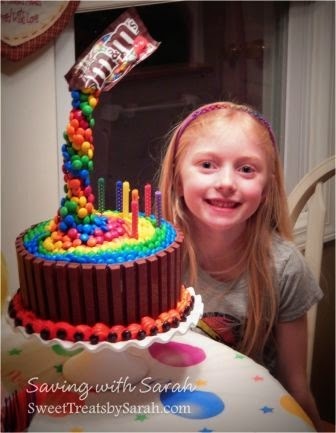 If you are thinking about doing a cake like this, there is a nice tutorial available from My Cupcake Addiction here. 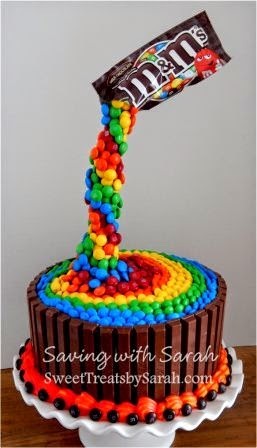 Going random with the M&M's will surely save you time! My daughter had a Spongebob cake when she was 3 or 4. I told her no repeats! But, as it turns out, she decided to have a movie party (Soonge Out of Water) with her friends....so.... I caved. 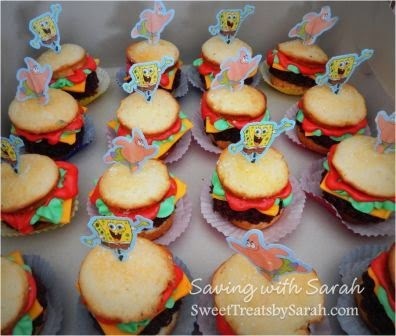 No cake - instead I went with Krabby Patty cupcakes! 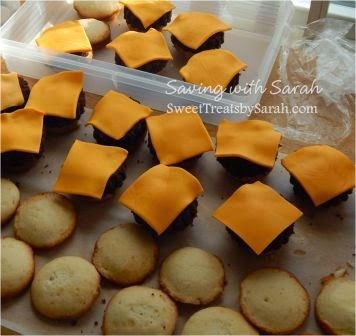 The cheese slices were made from modeling chocolate (McGreevy Cakes has a nice tutorial on modeling chocolate here). The bun is a white cupcake sliced in half. I cut the patty from chocolate cake with a biscuit cutter. Lettuce and ketchup are both buttercream frosting. After assembling, I brushed the top "bun" with water (mixed with a little tan food coloring) and sprinkled with white sugar crystals. The cute little picks were purchased at Party City. Phew, almost done. 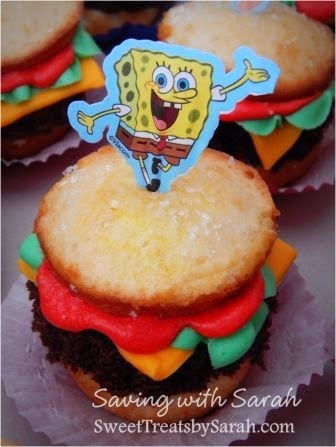 Last but not least: A few Spongebob Coloring Book cookie sets and make your own Superhero masks for the party favors. Now I'm tired. Oh I almost forgot, I must give my husband credit too. He always helps to cut, pack and clean for a party. He is amazing - he has a knack for keeping me calm when I'm stressed to the max. 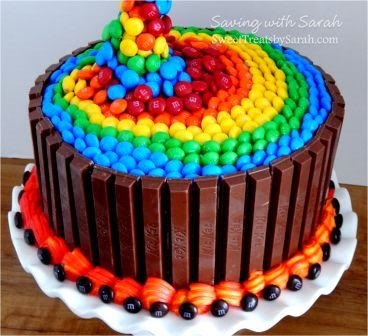 Hello, how many kit kats do you have around the cake? and what kind of straw do you use for the m and m's?